advantage of our Special Offers. 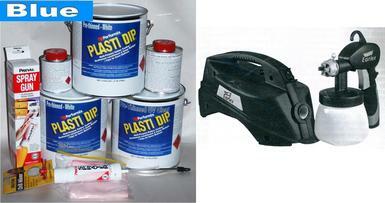 Plasti Dip Medium Car Kit & Spray Gun. 1 x Earlex MS2901 Spray Stn. Pre-thinned Plasti Dip is ready for spraying. Wipe surface with alcohol prior to applying Plasti Dip to ensure surface is clean. DO NOT USE PREPSOL. Stir frequently whilst spraying to stop separation of Plasti Dip and Thinners. We recommend 5-7 thin spray coats as Plasti Dip is air cured and will not dry if applied too thickly. © 2011 plasticdip | All Rights Reserved.